An exhibition is an organized presentation and display of a selection of items, usually within museums, galleries and exhibition halls. 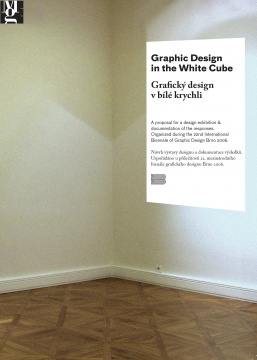 Essay accompanying the exhibition Graphic Design in the White Cube during the 22nd International Biennale of Graphic Design Brno 2006. Nineteen designers and collectives were commissioned to design posters for the design exhibition in which they were to participate. Instead of bringing work from the outside to the gallery, the work is made for the gallery. Instead of recreating the context for the exhibition, gallery conditions are the context for the work. A critical review and description of an open-structured live multimedia performance series which took place in the Netherlands in 1999.